Despite all the talk about the weather, American businesses managed to bundle up and survive -- even thrive in some cases -- during the Polar Vortex. Corporate results so far have been better than expected after the coldest winter in recent memory. More than half of the companies in the S&P 500 have released their first quarter "report cards," and two-thirds exceeded Wall Street's expectations. As of this week, earnings for the group are up 2.2% versus last year. "The weather had huge impact on estimates," said Jack Ablin, chief investment officer at BMO Private Bank. "Expectations were so low they were on the ground, so most companies were able to hop over." As is often the case, analysts started out with very optimistic forecasts at the beginning of the quarter. In January, they were expecting earnings to grow 3.6%, according to data from S&P Capital IQ. By April, those same analysts were expecting earnings to fall 1.2%. Sentiment was especially "chilly" after JPMorgan's (JPM) results fell short of expectations on April 11. Now, the consensus is that earnings will increase 2.2% when all is said and done. Of course, there's a big difference between beating low expectations and reporting truly robust profit growth. Companies that are part of the much watched "500" have reported record earnings for seven quarters in a row. But that streak looks set to be broken this time. Earnings per share are expected to come in at $27.28, compared with earnings of $28.46 in final three months of 2013, according to S&P Capital IQ. "The most commonly cited reason for weakness has been poor weather during the quarter," analysts at S&P Capital IQ wrote in a recent report. Multinational companies pointed to unfavorable foreign exchange rates, while the banking industry was hurt by a slowdown in mortgage lending, according to the report. Snowbound consumers were apparently unable to make it to Costco (COST). The retail chain took a one percentage point hit to sales in February due to weather, according to chief financial officer Richard Galanti. "It has been all over, particularly in the U.S., snow, rain, just crazy weather," he said. The fast food industry also felt the sting. McDonalds (MCD) said sales at U.S. stores open at least a year fell 1.7% in the first quarter. However, rival chains like Burger King (BKW) and Chipotle (CMG) both said store traffic was down during the cold snap, but their earnings still topped expectations. The snow did make it difficult to deliver packages. UPS (UPS)said the weather reduced profitability by $200 million in the quarter as lost productivity, snow removal and higher utility costs took a toll on the bottom line. FedEx (FDX) said operating income would have been $125 million higher if not for the weather. But some companies still managed to soar. The airline industry did fairly well considering that tens of thousands of flights were canceled in the quarter. American Airlines (AAL) alone canceled 34,000 flights due largely to weather. That translated to $115 million in lost revenue and reduced profits by about $60 million, the company said. That said, the company still managed $10 billion in revenues, up significantly from the first quarter of 2013. Delta (DAL) said the weather shaved off $55 million from its quarterly profit, which still exceeded analysts' expectations. The stock hit an all-time high recently. The cold was a major boon for the utilities sector, where overall earnings are expected to be up 22%. Prices for natural gas spiked in the first quarter as consumers cranked up the heat and ran their furnaces non-stop. Dominion Resources (D), a power company based in Virginia, said the unusual weather drove its earnings up by 5 cents per share. Yet earnings growth is expected to be strongest in a sector that has seemingly nothing to do with the weather. Telecommunications companies could see earnings increase 43%, according to the latest estimates. 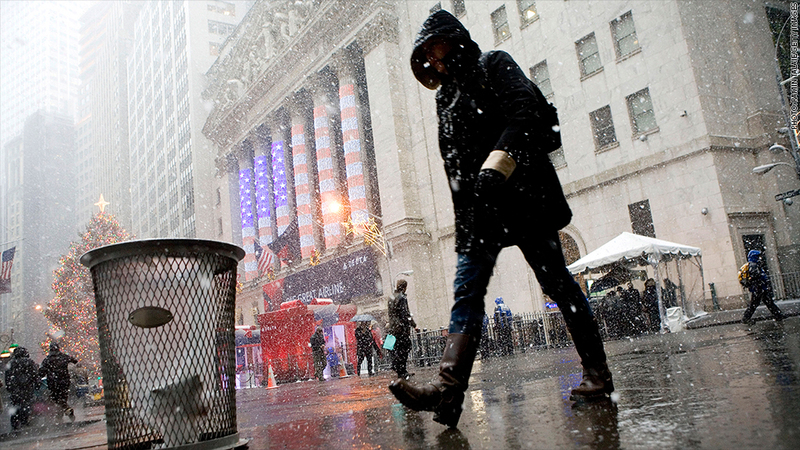 Meanwhile, the financial services industry, also fairly insulated from the weather, likely had a tough quarter. Bank earnings are expected to fall 9%. The winter weather certainly had an impact, but it was hardly enough to freeze U.S. businesses entirely.